Angie is a blonde (or perhaps platinum bottle-blonde) student at Lawndale High School. She is part of the Lawndale High School cheerleaders. She is first seen in "Daria Dance Party," as one of several cheerleaders who are friends with Brittany Taylor. She is also seen in "I Loathe a Parade," on a float with Kevin and in "The F Word"
Of all of the female characters in Daria, Angie might be the one most friendly with Brittany, a rare case of a main cast member having a strong friendship with a background character. In "Fat Like Me," Jane hypothetically asks Brittany what she would do if Angie cheated on her with Kevin. Brittany responds that Angie is her friend and that she would never do that. Angie's role appears to be the breaker of bad news to Brittany. It is Angie's job to inform Brittany that her date, Robert, dances like a "geek." She tells Brittany (off-screen) that Kevin was "smiling (his) head off" at a lady customer purchasing nuts in "It Happened One Nut," which provokes an angry response and leads to Brittany confronting Kevin at the nut stand. During "I Loathe a Parade," Angie is on a float with Kevin. She is wearing a sash marked "FOOTBALL SWEETHEART." When Kevin tries to come on to Angie, Angie replies that she's unhappy with how Kevin is acting -- and that Brittany, her friend, is right behind them. When Brittany attempts to change her personality for a class assignment in "The F Word," Angie seems the most concerned about her, commenting that she's "lost her way" and "doesn't know who she is", and is the only one to argue that Lisa shouldn't be trying to replace the girl. Nevertheless, she reluctantly goes along with Lisa in (temporarily) kicking Brittany off the team and having Jane try out as her replacement. Brittany is reconciled with her fellow cheerleaders -- and Angie -- at the end of the episode. Angie, along with the other cheerleaders, gets into Great Prairie State University in "Is It College Yet?". She notes that that was the only school that any of them got accepted to. Angie is a recurring figure as she's one of the few non-Brittany cheerleaders we know the names of. Her personality and role varies, though she's usually presented as popular and (as in the show) buddies with Britt. Angie sometimes surfaces as an antagonist. In the Turnabout Confusion series, she is part of the cheerleaders 'faction' following the lead of Dawn Wilkins in waging social warfare, and first to raise concern that Daria will become popular; she is increasingly worried by how far Dawn is taking things. 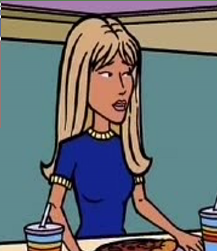 In "God Save The Esteem" she represents the cheerleaders in a popular girls' cabal to stop Daria dating Tom Sloane; she is originally dating Mack but he breaks up with her when he finds out about this, which Angie takes pretty hard. A larger role happened in 2018's "Second Chance for Love" by David Falkayn, where Angie dates Hungarian teenager Elizaveta Bathory. Angie's full name is Angelica Harmon and she is an only child living with her mother, Jessica Harmon. Angie's father, Jack, died in an automobile accident when she was ten years old. On her first day in kindergarten, she met Brittany Taylor and soon became friends with her. Their friendship has deepened over the years with both girls considering the other to be their best friend. Angie is a solid "B" student in school doing well in English and history, but only average in math and science. She is also a cheerleader and belongs to the dance club. Angie enjoys reading science fiction and fantasy as well as murder mysteries with her favorite authors being Larry Niven and Ursula K. LeGuin in science fiction, Piers Anthony and Tolkein in fantasy, and Mickey Spillane in murder mysteries. She also enjoys jazz and loves hot tea and is mildly addicted to coffee. Prior to meeting Elizaveta Bathory, while moderately popular due to her association with Brittany, Mack, and Jodie, and her being a cheerleader, Angie kept her life outside high school mostly private with only Brittany getting a few brief glimpses of the "real" Angie. To avoid being branded as a "geek", she kept secret her interests in reading and music. Besides Brittany, only Nikki and Lisa, two other close friends as well as cheerleaders, knew about her outside interests. In "Second Chance for Love", Angie is homosexual. Before meeting Elizaveta, Angie stayed in the closet, not even telling her closest friend, Brittany, about her sexual preferences. She rarely dated, and then only to maintain appearances. She had no steady or even casual romantic relationships prior to her involvement with Elizaveta. Because both girls have blonde hair and are cheerleaders, Jane Lane coined the nickname "Barbies" for them. They have since embraced the nickname, much to the initial consternation of Jane. At the beginning of her sophomore year, she met Elizaveta Bathory and the pair soon developed a close friendship that evolved into something deeper when they kissed at the end of a dance routine they did for the opening of the new coffee house in Lawndale. After that kiss, they embarked on a long exclusive romantic relationship that resulted in Angie coming out of the closet and embracing who she is as regards not only her sexuality, but who she is as a person. She is deeply in love with Elizaveta and will go to any lengths to protect her and the feeling is mutual on the part of Elizaveta towards her. For the most part, their relationship has been received with neutral feelings by the majority of the Lawndale High student body and faculty. Some students such as Quinn Morgendorffer, Daria Morgendorffer, Mack, Jodie, Jane, Brittany, Kevin, Nikki and Lisa, and some faculty, most notably, Claire Defoe, Timothy O'Neill, and Anthony DeMartino, are openly supportive of the pair. A few students such as Skylar Feldman and Sandi Griffin are opposed. The great majority of students and faculty, however, are neutral--or at least are keeping their thoughts to themselves for the moment. She can be very blunt and somewhat sarcastic in her manner and while she loves Brittany as a friend, is often frustrated by her actions--especially where it concerns Kevin. She is also not afraid to deliver hard news to Brittany or anyone else when called for. Had she not met Elizaveta, Angie most likely would have remained in the closet, not revealing anything of her private side as she maintained the facade of being a fairly popular cheerleader until she felt safe enough to do so in college. However, meeting and falling in love with Elizaveta has changed not only her priorities, but her outlook on life and on herself. At the end of "Second Chance for Love", she followed Elizaveta through a portal into another universe where she graduated Starfleet Academy and is now an ensign assigned to the Nebula-class starship USS Bellerophon as a helmsman. This page was last edited on 9 January 2019, at 20:03.